In the case that thin to viscous media should be volumetrically filled into small containers, in addition to a gentle and low-pulsation delivery an accurate dosing is imperative. This follows not only from the facts, but also the EU-condition with regard to the filling of packaging in order to avoid penalizing consumers. In the final packaging directive is normalized, the extent to which the mass or volume of the contents of a box may differ from the print on the package. The standardized requirements were met there are implemented by our designers with the following filling plants. For dispensing of low-viscosity to medium viscosity media according to specified recipes a Multi-Component Filling and Dosing System was supplied that is based on the principle of own eccentric screw pumps and the different media can reliably and accurately be filled and dispensed. According to the customer‘s application, three different components should be dosed according to pre-selected recipes from storage containers in manually supplied container. Starting point in developing a solution proposal were initially the own eccentric screw pumps. They have a rotating screw conveyor made of stainless steel 316Ti (rotor) and a counter-rotating, stationary elastomeric stator of the available materials NBR, NBR light, FKM, EPDM or EPDM light. Due to the different slope and transfer coefficient of the two conveying elements create cavities that mutually open and close due to the rotation of the rotor and whose volume is always the same. The gentle and pulsation-free delivery with extremely low shear eccentric screw pumps are therefore ideally suited for dosing. The dripping of medium is prevented by entering a withdrawal value. 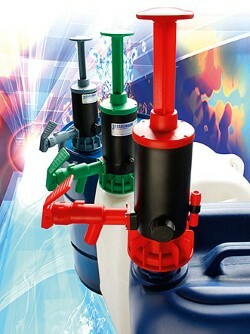 By reversing the direction of rotation in the filling nozzle is at the end of dosing a minimal amount of product in the dispensing nozzle sucked back, therefore a filling valve will not be needed. The input of the recipes with the dosing of the individual components is done via an input display, which is housed in a central control cabinet. The central control cabinet, is due to the customer‘s specifications, in a separate room. In order to ensure process safety, the changing of parameters and recipes is only possible by password and therefore protected from changes. Another control cabinet, made ​​of stainless steel, with digital display of the currently selected recipe is located at the bottling plant. 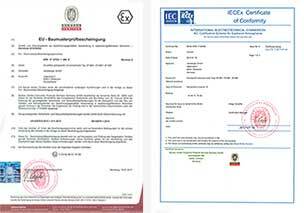 To start the filling process is first necessary to calibrate sample expenditure for each of the components. This is done by entering the nominal quantities and the calculated actual quantities of the sample output. 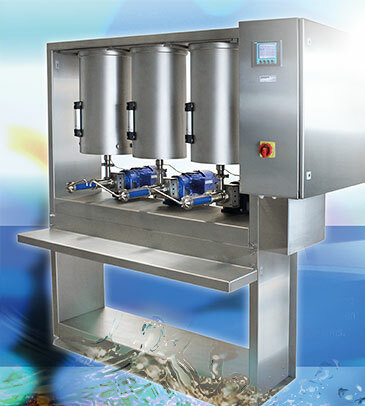 The shown Multi-Component Filling and Dosing System was designed very user-friendly due to the easy disassembly and cleaning. In addition to a precise dosage it ensures low pulsation, gentle product handling without dripping. Beyond a large flow rates and application area, also a password-protected prescription and conveying volume prefix was implemented. 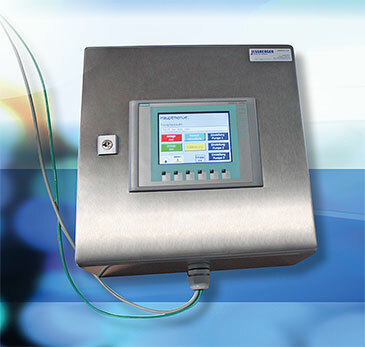 Due to its modular design it can be used for many other applications in the field of dosing technology. 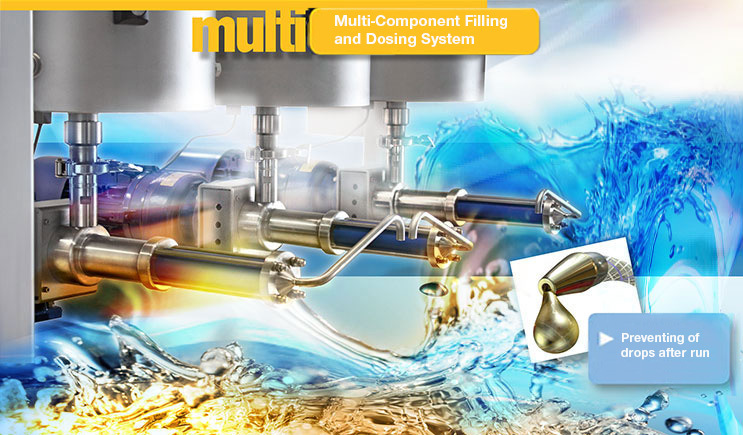 The dosage by means of the Multi-Component Filling and Dosing System is based on the illustrated volumetric principle by means of horizontal, infinitely variable controlled eccentric screw pumps. With each revolution of the rotor a by the customer desired and therefore predefined volume is delivered, the filling quantity is determined by the number of revolutions. Horizontal eccentric dosing screw pumps with gear motor. Storage tank made ​​of stainless steel, with sight glass, optionally with heating jacket available for warm water heating. Frequency inverter (in central control cabinet). Control cabinet with digital display. Central, password-protected control cabinet in a separate room. Foot switch for starting the dosing. The input of the recipes and dosing batch is done via an elegant display with a keyboard. In order to ensure process safety, the changing of parameters and recipes are protected by a password.